Looks like I won't be able to progress as fast as I want on this project. Being a father, husband, freelancer and more takes away the hours, but I'll document the process here anyway in case others want to try something similar. Today I re-did the X-axis completely and also modified the Y axis a bit. In addition, I printed a cable chain so the wiring don't cause any problems as well as some endstop-mounts for Sainsmart/MakeBlock. Look mom - it moves! This is starting too look like something. This is just a few lines of code with the AccelStepper library. Servo-arm up next! 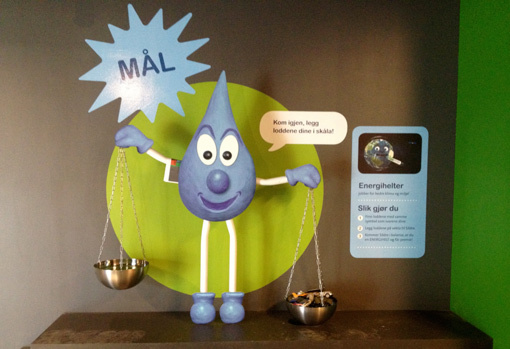 For the recent project I did at EIS (The Energy Centre at Hunderfossen Amusment Park), I needed to build a scale. As kids walk around the exhibition, they're answering questions and at the exit there is a cool-looking scale. Here you select felt-bags based on your answers and their weight decide if you got the earth (or rather scale) in balance. I picked up a couple Load Cells from Ebay and thought they were like the many other analog sensors that I've used. It turns out that a Load Cell does output a signal, but it's really weak. To get the signal I needed, I had to find a suitable "Load Cell Amplifier". After some quick searching, I realized that these come in many flavors and industrial versions are somewhat expensive ($200 and upwards). I did some more digging and found this nice little board from LeoBodnar as well as a nifty IC: the INA125. This is an IC that does exactly the required amplification for $7. My Load Cell has other colors, so signal+ cable is blue, signal- is white, 5V is red and GND is black. I've seen load sensors with colors all over the spectrum, so make sure you have this documentation before buying from Ebay. Later this week I'll head up to the Hunderfossen Amusement Park to mount this modified version that gives me pretty much all the levels I want by just changing a single resistor. Not bad! 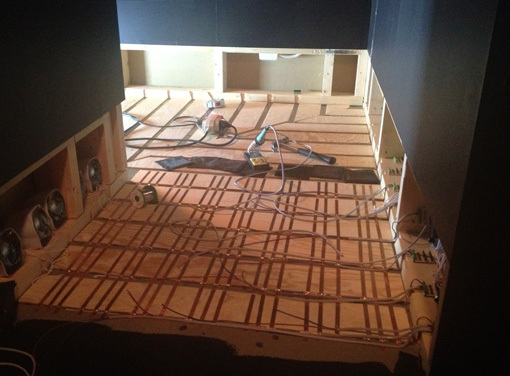 I've worked on several projects with the company SixSides and about a year ago, they asked me if I could build a floor that reacted to the people walking on it. The basic idea was to play back sounds of walking on other surfaces than you really were. Of course I said yes to the challenge! My first idea was to make a button-matrix that sensed where you stepped, but after making a quick prototype I realised that this wouldn't create a very believable experience. Then it dawned on me that it would be MUCH more fun if it was actually pressure sensitive. During this project, I've played around with different conductive fabrics and it's been a blast! 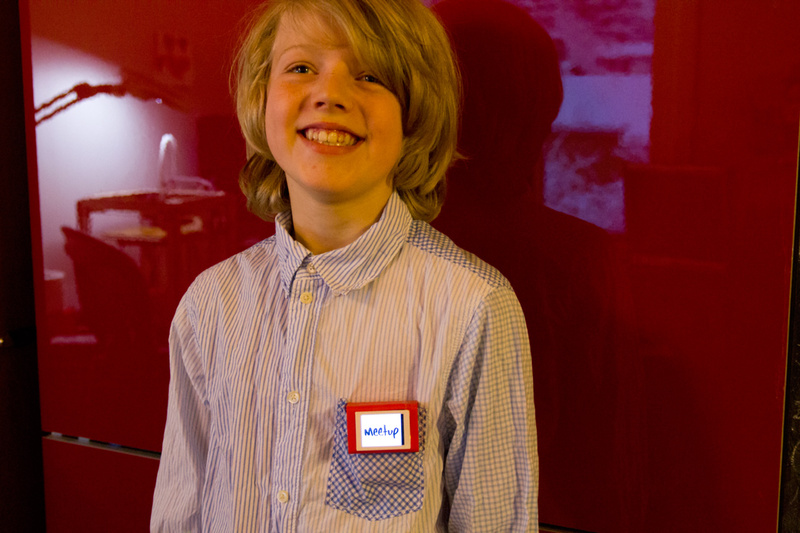 I really cannot praise the company PlugAndWear (Texe srl) enough. They're simply the best source of conductive fabric that I have found and they ship crazy fast from Italy to Norway (2 days!). 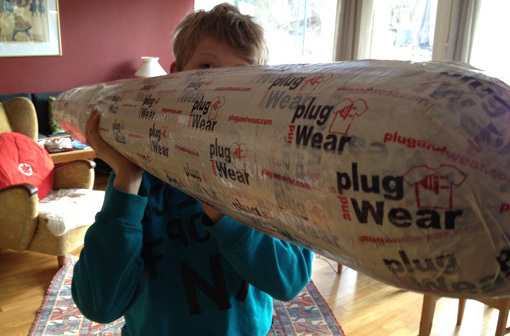 This is how you'll receive 14 meters of conductive fabric! One of the many products they have is called Velostat. This material has a very unique property - it's resistance decrease with pressure. It does so in a way that if you just put a layer of Velostat in between two conductive layers, it will give you about 800 levels of pressure for an adult person stepping on it. 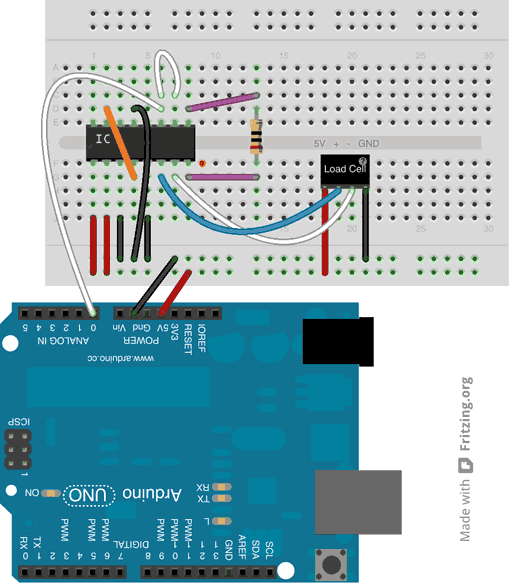 If the person weighs more than 90Kg, you will most probably be able to read out the remaining 200 levels using the 10-bit analog inputs of an Arduino. So I knew that Velostat was a good idea, but I needed a conductive layer both at the bottom and above and one of them should perferably lift up to ensure that there was no contact if pressure was not applied. Copper tape is a really good conductor, so I figured that I could use that as the bottom layer. It is easily taped to the floor and you can solder onto it quite easily. You can get this at multiple locations. I found mine at a shop for artists that make glass paintings. The upper layer was more difficult. I eventually settled for the fabric called "Doubleface knitted conductive fabric" that has a polyester-thread layer and a stainless steel-thread layer that are knitted together. In my tests, this has stood up to quite a bit of physical abuse so I'm pretty sure it'll last quite long before being fully compressed. The only drawback of such a fabric is that it's really hard to work with, given how different these two layers and velostat are. I tried sowing these together, but it was incredibly hard to get the fabric to stay straight. I tried various methods for making the sensors, but the most lasting solution seemed to be using textile tape from Tesa. Just tape together a layer of the knitted fabric ( with the steel side up) onto the Velostat. My only problem was of course that this was a manual job and I needed 300 of them. More about that later. Above the sensors there were to be a floor of some sort. 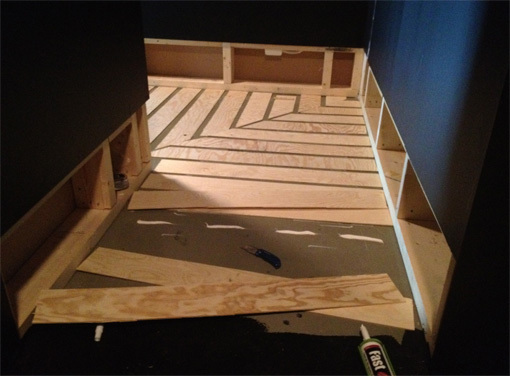 I did my test using Linoleum, but we ended up using a softer floor covering. I also used Fritzing to make a custom PCB for this (download below). It's not that it was really required, but it made the installation look professional and simplified the mounting a lot. First add 4mm plywood to put the sensors on, making a sort of cable-duct in between them. 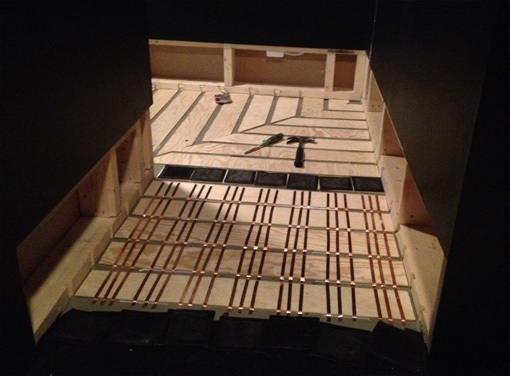 This ensured that the soft, silicone-covered cables were not too exposed to the constant pressure of people walking on them. 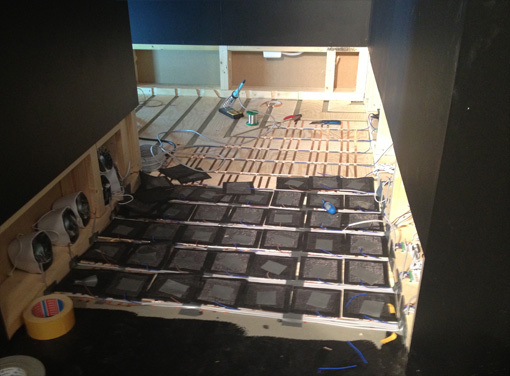 After this has been done to the entire floor, I put sounds on the SD cards, programmed the Arduino's with their sound-cards and mounted them along with some suitable speakers. I'm really happy with the result! The finished floor is so sensitive that I can sense a soda-bottle cap falling onto it! The sound playback happens the instance you put pressure on the floor and it really seems like you're walking on ice or other things. Selecting the correct sounds is of course a difficulty, but it's easy to adjust this. It's just files on a SD card after all. I've also written the software so that wear'n'tear on the sensors won't affect how the installation work. They don't use the real pressure-level, but rather changes in an averaged level. If a floor tile becomes fully compressed so it no longer produces level changes, you can just rip it up and tape down another, so maintenance is easy. 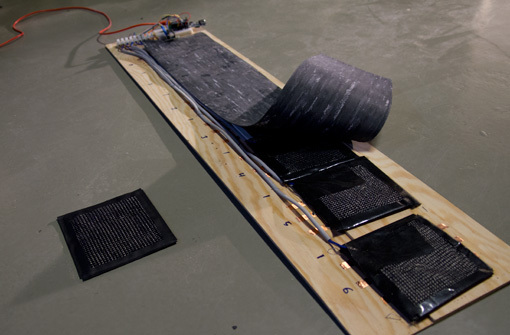 The floor consists of 40 strips of 15 cm width, each with an Arduino Nano measuring up to 8 sensors. 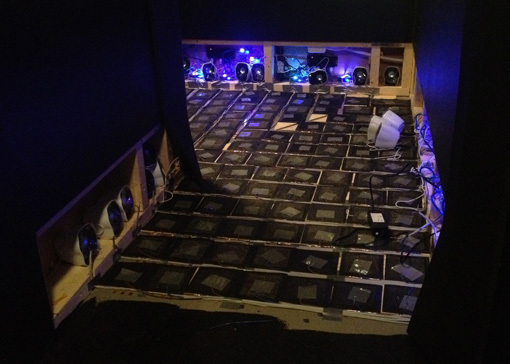 The complete installation is using 55 Arduino Nano's as well as sound cards from Gravitech. I opted for these since they're small and thus easy to mount. They're also very easy to get replacements for if that should be required. I now know that I should have used a much wider copper tape rather than three separate ones. Each one of these needs a soldered joint. Having just one rather than three, would have saved me 600 solder points and it would have been just as good. Another thing I've learned in the project is that building a small prototype really does not cut it. You need to build a bigger prototype to correctly estimate the amount of work required. In the end I spent about 16 hours on each meter of pressure sensitive floor. My estimate was just a third of this, so since this was a fixed price project I didn't exactly become rich. If I do a similar project, I'll definitely insist on hourly pay or get somebody else to do the actual construction of the floor. I'm using .OGG formatted files. MP3 files will add a few milliseconds of silence at the start of the sound and in this case, it ruined the experience. The OGG format does not have this problem. The next time I design electronics that require multiple similar resistors, I'll definitely look into using a resistor-network instead. Making the pressure sensor tiles took forever… Help is required if you do something like this, so a big thank you to Liv @ Sixsides for helping me out! 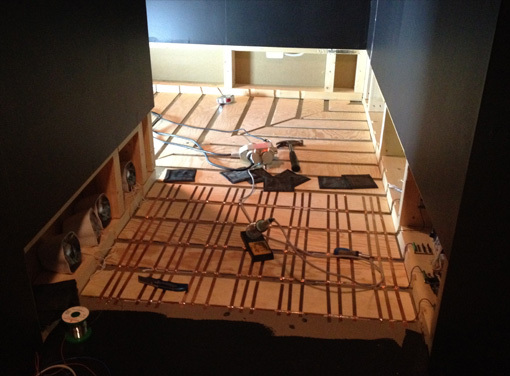 As soon as the walls are closed, it's a lot more work to get cables to the right spot, so make cable ducts that are wider than expected. Arduino's are really solid for use in installations, but poor quality USB cables will affect both sound and stability. Despite taking a long time, this has been a fantastic project! I really loved to do the whole thing from concept, research and realisation. It's so many other things one could use such a floor for, so I can easily see people building similar things as inputs for games and music. It also involved lots of other sensors (touch + distance + movement), but I'll do a separate post on those at a later time. 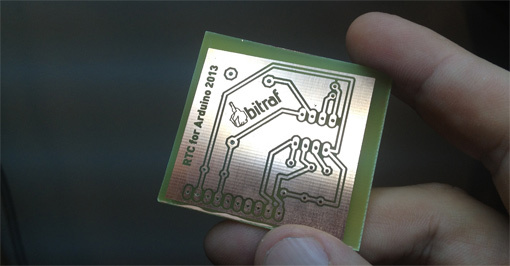 The last months at Bitraf has been quite hectic in terms of workshops & activities. First there was a soldering workshop that I helped put on, then a PCB design workshop and that was followed by a PCB etching workshop. I also organized our third 3D Printer Meetup there. Peter, Trygve and Carl at the hackerspace has now gotten my dad's old Roland CNC to drill all the required holes in a PCB based on the Eagle files, so it's really possible to make nice things at Bitraf these days. All together this is about $2 in parts, even for a very modest volume. Not shabby and I highly recommend both TaydaElectronics (Thailand) and Spiratronics (UK). Both are great shops that ship quickly to places in Europe and I use them a lot in addition to ebay.co.uk. 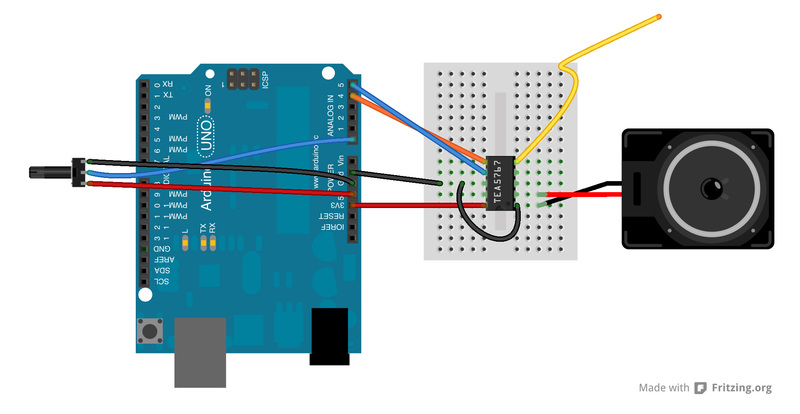 I looked online, but couldn't find something that others had made that was "free to use" and I had an idea: why not make it plug straight into one of the header rows on the Arduino? That way it would be real plug-and-play since both power and the analog pins used for i2c are on the same side. Above you can see how this turned out - it plugs right into the Arduino Ethernet shield. I looked up the reference design and looked at how others had done it before and then made a first go in Eagle. After a couple fails (I forgot to "fill" with ratsnest + had counted the pins incorrectly) I got a couple nice looking PCB's. I didn't have the required clock crystals, but I got these from Spiratronics in just 3 days. Today I soldered it up and plugged it in. Guess what - it didn't work… I looked over the PCB with a magnifier glass and cleaned up some excess solder along the traces and it still didn't work. Bummer. I went online and looked at how Adafruit did theirs and then it struck me - I had put the IC on the wrong side of the PCB. After doing this, it worked like a charm! I used the Adafruit 1307 library and it works just as I hoped. I'll definitely make a couple more of these for other projects and so can you! Below you can find the Eagle schematic + board and here's the final stencil to use for the etching. My brother is thinking about going back into the signage business and as he would start up his own company, he'll need to build himself a network. My favorite way to connect with people and communities these days is Meetup.com - a website that help you host meetings with ease. So - I set out on a mission to help people remember my brother and what his company delivers. 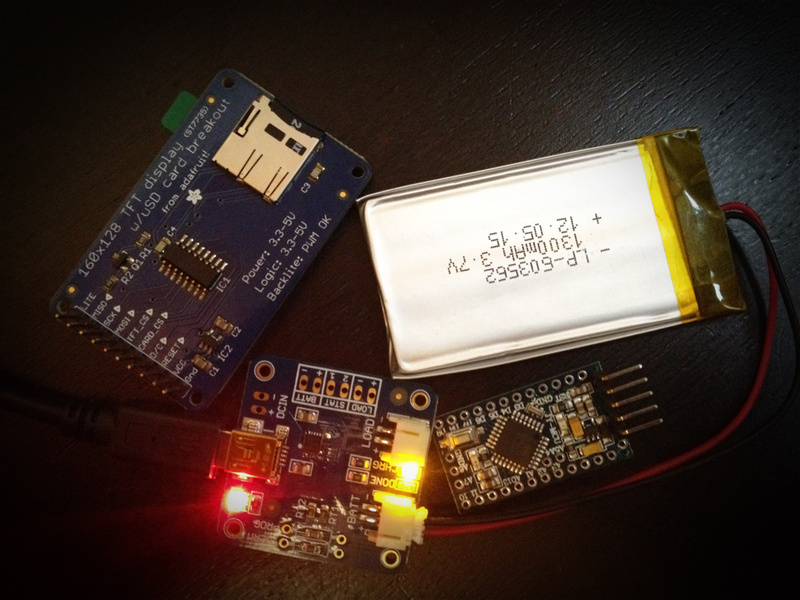 I've long wanted to do something with the neat little 1.8" LCD screen I picked up from Adafruit some months back and looking through their site I found that they also have this neat Lipo charger as well as slim, matching batteries. What if I made a small LCD-sign that he could drop in his pocket? I ordered the components and started modeling. About a week later, the parts arrived and I modified Adafruit's example file a bit to load images one by one from the SD card beneath the screen. That gave me a simple, but effective slideshow. All my brother needs to do is to to change the contents is to make some BMP images and dump them onto the SD card. Easy! After a few iterations I came up with this case. The part containing the battery is not the slimmest, but it's also meant to go inside your shirt pocket. I could have made it slimmer, but then I would have to sacrifice battery time. With it's 1300mhA battery pack, it lasts 2 hours on one charge and charging it takes a little less than an hour. I could have saved a little space by skipping the proto-board that lies in between the electronics and the battery, but it made mounting things and getting the USB-port right for charging. I might remove that if I do a next iteration. The part that is visible on the outside of the pocket is much slimmer and it looks like the red and white Meetup.com logo. It took quite a bit of fiddling to get the case right. 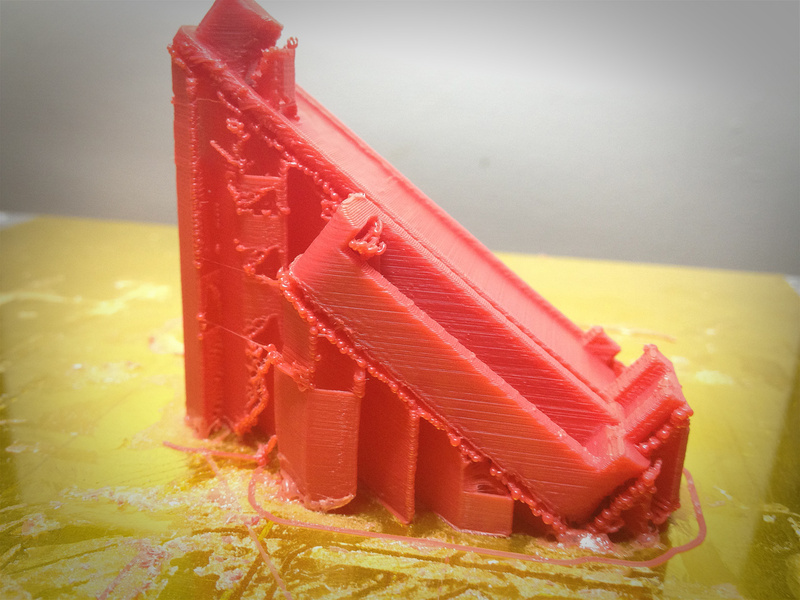 I learned that by slanting the print 28 degrees while printing, a lot less cleanup was required. The supports came off really easy and printing the parts like this actually made them much stronger and easier to glue together in the end. I usually use PLA plastic for all my 3D printing, but for this I used ABS since it can be grinded and polished (PLA can't). Towards the end of the project I didn't quite get the time required, but it was a fairly polished thing I gave away. It took me 4-5 evenings to make this project and I think it was worth it. I could of course have bought a CD or something from a shop, but this was a personal gift that (as far as I know) nobody has. Much more fun! Here's a shot of junior showing off the final sign and if you want to make your own - grab the files on Thingiverse and components from Adafruit. It's been ages since I posted anything on electronics, even though I keep playing to learn more. I also frequent dx.com quite a bit and a fun little thing I picked up was a $2 radio-curcuit-board. It's a fully programmable FM radio that is 11 x 11 x 4 mm in size. As usual with electronics from China, the website barely says anything about the product. You just have to buy one and see if you can make it work. The circuit came without any documentation, but Google is your best friend. The datasheet was all in Chinese, but thanks to Google Translate I figured out that this circuit was very similar to many other implementations of the TEA5767 radio chip. These chips all have the same pin-density as ZigBee modules, so I soldered on some ZigBee-headers to make connecting it easier. As you can see from the picture above, my cables were all over the place. Below is a cleaned up sketch of how to connect the TEA5767 radio module from dx.com (click to view full size). The audio amp obviously goes in between the speaker and the TEA5767 output. The TEA5767 can be controlled using either Serial or I2C, so it's really flexible. It's not very powerful, so you'll need an audio amplifier to hear anything. I used an Adafruit MAX98306 amp breakout that I had from a former project. I won't get any style-points for this setup, but I'm glad I got it to work almost right away. This instructable made the code part really easy. Using a 10k pot to control the frequency also highlighted that more than 10-bit resolution would be nice (for better precision) or maybe one should rather use an encoder? Good learning fun anyway. Here's a vid of it working. I spent most of yesterday eve at Bitraf trying to make the official Arduino Wifi Shield behave properly as there is a bug in the firmware that it comes with. One of the Bitraf members has a cool project that involves remote control of servos. He planned to use the Wifi Shield, but it kept loosing it's connection at random intervals - no pattern to it. As I have the same shield, I tried to figure out how to download and install the new firmware from GitHub. I couldn't find any good description on how to do it, so here's how I did it on OSX. It'll be quite similar on Windows and Linux. The installer expects the files to be inside the Arduino-app folder. Copy wifiHD.hex, wifiHD.elf and the other files from the wifishield/firmware/binary folder into /Applications/Arduino.app/Contents/Resources/Java/hardware/arduino/firmwares/wifi-shield/ (or where you have your Arduino app). Error: The installed version of Xcode (2.0orlower) is too old to use on the installed OS version. Version 4.1 or later is recommended on Mac OS X 10.8. So off we went to Apple to get the new version. Plug the USB Mini cable into the shield. You should not upgrade the shield while it's mounted on an Arduino. To program the shield, you'll need to enable a jumper. This puts the chip in DFU-mode that enables reprogramming it. There is no "J3" marking (mentioned in documentation) on the shield, but there is also only one jumper there so you can't go wrong. Just place it across the two pins and you're ready to go. If you fail to set this jumper, you'll see an error "dfu-programmer: no device present" since there is no programable device connected. Once the upgrade goes through, remove the jumper and set it on just a single pin. That's it. Not hard once you know how to do it and have all the required software installed. It's however a far cry from the simplicity we're used to with Arduino. Maybe they'll find a smoother way to solve this? Also something VERY interesting we discovered that isn't documented - if you have connection problems with this shield, make sure you don't use/set PIN 9! It's not documented as being in use, but something definitely goes on with this pin. The PIN also has it's own LED (marked L9) on the shield and it flickers weakly during use of the shield so something undocumented is going on there. I have to say that while it's fantastic to have an officially supported Wifi shield, I don't really appreciate that it takes up the PWM pins 10, 11 and apparently 9 as well. I'd much prefer I2C or a more configurable solution like for instance the Adafruit Wave Shield offers. Marking what pins are used directly on the PCB is also a great help for users. We also figured that the Atmega 32UC3 chips are not too expensive, but the WiFi chip on this shield is $20 even in fairly big quantities. While this makes the shield quite expensive, it's probably worth it's steep EUR 69 price. Keep in mind though - with an Arduino UNO, the total setup is 89 EUR ($115). A Raspberry PI and a wifi dongle is much cheaper. 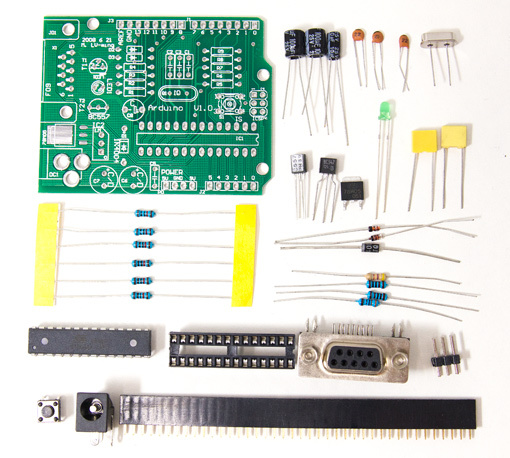 In fact - you can even get Adafruit's complete PI-kit for only $105! Have a look at the picture above comparing both solutions and you'll see that they're both small in size, so depending on your need - maybe it's not an Arduino you need? I have a Sparkfun FTDI adapter as well and this one is marked DTR instead of RTS, but it's otherwise similar. One thing to note - while the board itself is 3.3V there is no problem to use a 5V FTDI programmer with it. The board itself can run on anything from 3.3V to 12V so it's quite a flexible board. Earlier you could access the website of the makers of this board to access technical documentation, but now it's gone (or hard to find). Buying this board was just a test, but would I buy more of these? Yes and it really comes down to price and how Open Hardware works. I recently delivered the first part of my first commercial project based on Arduino and electronics. For this project, I'll need to make something like 50 similar units that respond to a sensor. The prototypes were based on Arduino Uno's and if I buy these locally I'll pay $43 per microcontroller. The Uno's are rather big so I'll certainly use something smaller for the production phase. If I do the project based on Arduino Pro Mini's, I'll pay $26 per MCU if bought here in Norway. I could also buy them direct from Sparkfun and with shipping, VAT and customs handling they'd be $22 apiece. Not shabby. However, for such projects I wouldn't use off-the-shelf solutions. It's better to make custom boards specifically for the purpose and these would be something like $10 for the PCB and components - not including the soldering. I've done this several times now for personal projects, using only through-hole parts and soldering them by hand. In other words - a project like this wouldn't really be of any benefit to the Arduino project anyway, because it would simply not be the right way to solve such a project. I really love working with through-hole and DIL parts, but of course SMD is even cheaper than that. Here's the crux - with the low price, free shipping and how the customs limit in Norway works, I can get the chinese clone-boards for less than $9 apiece. I can't even buy the SMD parts for that price, let alone solder them. Maybe the answer to this project would be to make a custom board with Arduino Pro Mini header-inserts? Update: I'm not entirely sure, but I think this may be the website of JY-MCU? It is crazy slow so it's definitely a chinese website… If you just wait 5-10 minutes, you'll actually find what I made above at the bottom of this page.